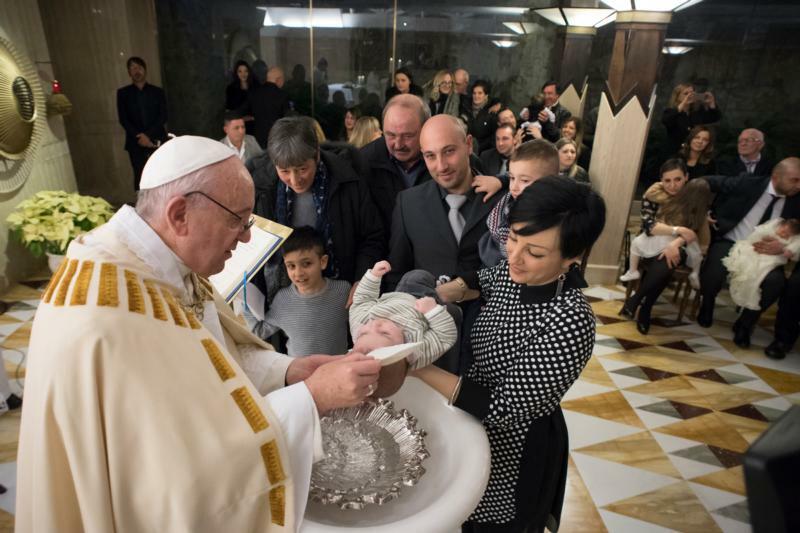 VATICAN CITY (CNS) — In a gesture of closeness to those who lost loved ones and homes following several devastating earthquakes, Pope Francis baptized 13 babies from central Italy. The pope celebrated the sacrament of baptism Jan. 14 in a private ceremony in the chapel of the Domus Sanctae Marthae, where he lives. The central Italian region — particularly the towns of Amatrice, Rieti, Accumoli, and Pescara del Tronto — were rocked by a 6.2 magnitude quake Aug. 24, 2016. Pope Francis visited the hardest-hit areas Oct. 4 and then a powerful 6.5 magnitude earthquake struck Norcia in the early morning Oct. 30, reducing the Basilica of St. Benedict to rubble. Meeting with youths from the parish of St. Mary in the Setteville neighborhood on the eastern edge of Rome Jan. 15, the pope said he had baptized the child of a man who lost his wife in the earthquake. However, he added, Christians must “respect this darkness of the soul” they see others experiencing, steadily standing alongside them in silence, but offering support and a readiness to help those who find it difficult to embrace the faith after experiencing tragedy.